The VCFS™* adds fire service capability to the standard Pikotek® VCS design through the use of a secondary sealing element that is capable of maintaining a seal while subject to a 1500°F (815°C) fire. The VCFS fire resistant gasket combines proven sealing performance in aggressive environments with the capability to pass the API 6FB, 3rd Edition fire test. Due to its unique pressure activated sealing mechanism, the heat resistant gasket requires far less bolt stress to seal than other gasket types. In addition, the engineered E-ring will serve as a secondary seal during normal operation and the primary sealing element during a fire. * Note: The “FS” or “Fire Safe” designation denotes only that this gasket has successfully passed the API 6FB fire test. Due to the fact that every fire is unique and many uncontrolled variables are present, no other claims regarding suitability or performance in a fire are made. Each designer, user and/or operator will need to assess their individual situation when deciding to install FS style gaskets. Covered under patents 266755, 7976074, 2271866. Withstands corrosive environments, including high concentrations of CO2, H2S, produced water, etc. Less make-up force is required resulting in less flange and bolt stress. Eliminate turbulence and flow-induced erosion between ring-joint (RTJ) flanges. To seal between flanges subjected to vibration/cavitation (i.e., compressor stations). 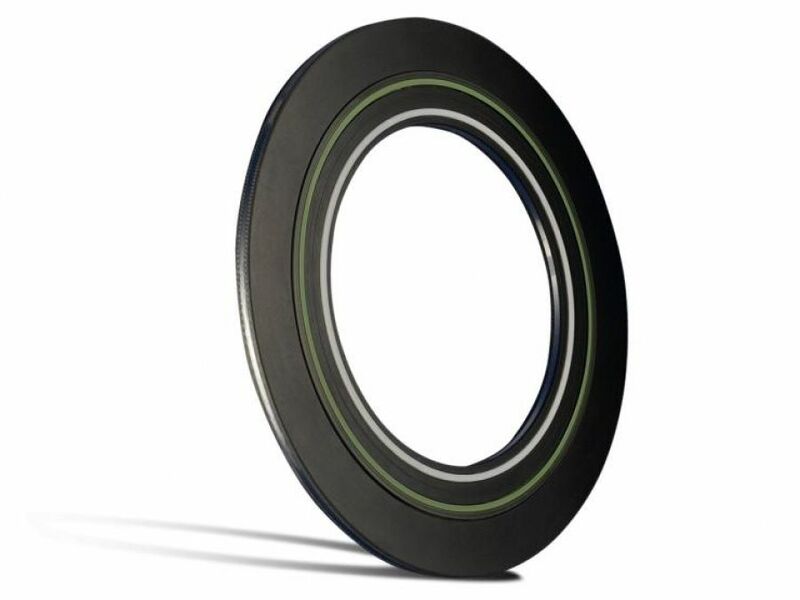 One isolating and sealing gasket, VCFS Type “F”, 0.260” thick or .308” thick, 316 stainless steel core retainer laminated on both sides with a G-10 fiber glass reinforced laminate containing a precision tapered groove to accommodate the controlled compression of a PTFE spring energized seal. Another groove shall contain a carbon steel backup ring with Halar® coating and an Inconel® E-ring coated with PTFE. Sealing element placement shall accommodate either flat, raised or RTJ face flanges. The PTFE seal shall be spring and pressure energized. The G-10 retainer shall have a 800 volts/mil dielectric strength and a minimum 65,000 psi compressive strength. The I.D. of the flange isolating gasket shall match the bore of the flange in which it is installed. Product have passed API 6FB fire testing. Note: Electrical values are based on laboratory conditioned samples in laboratory conditions. Exposure to moisture or elevated temperature will change values. The VCS family is designed to withstand the Very Critical Service environments found in oil and gas, chemical and energy applications – providing uncompromising performance and safety. Drinkwater Products was established in Louisiana in 1987, delivering best-in-class pipeline specialty products for the oil and gas industry, including pipeline pigging products.